These Oatmeal Cream Pies are soft and chewy just like the ones you grew up with. 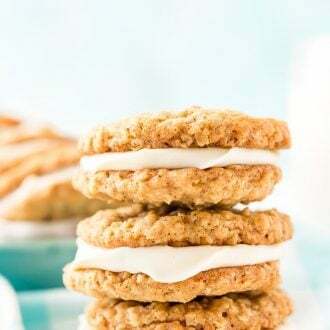 Sweet oatmeal cookies sandwich a creamy vanilla filling for an easy and delicious dessert! 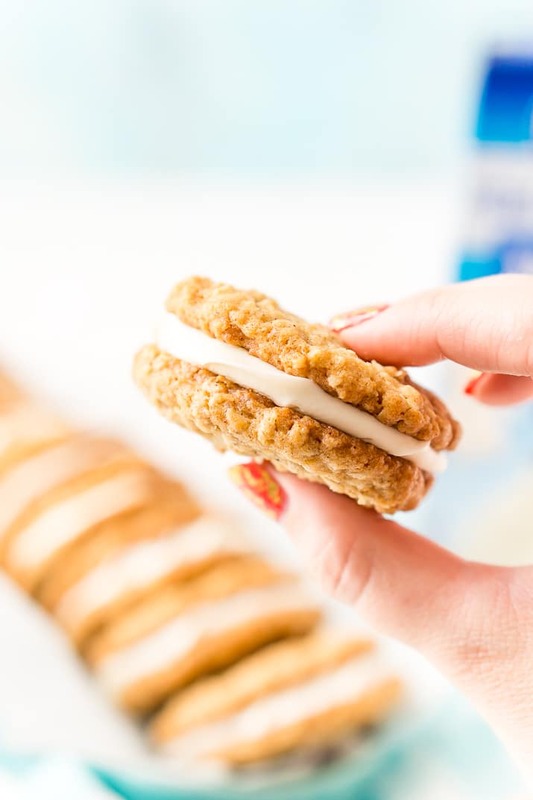 This Oatmeal Cream Pies recipe is a sponsored conversation written by me on behalf of Pillsbury™. The opinions and text are all mine. Remember those chewy, frosting-stuffed Oatmeal Cream Pies you used to have in your lunchbox as a kid? I recently had a hankering for the nostalgic treat, but rather than buying them at the store, decided to find a way to make them myself! There’s just something about those textured, spiced cookies, and paired with a smooth vanilla filling, they’re simply irresistible! Not to mention, my husband is a sucker for this sweet and creamy combination, so I knew this recipe would make him happy. 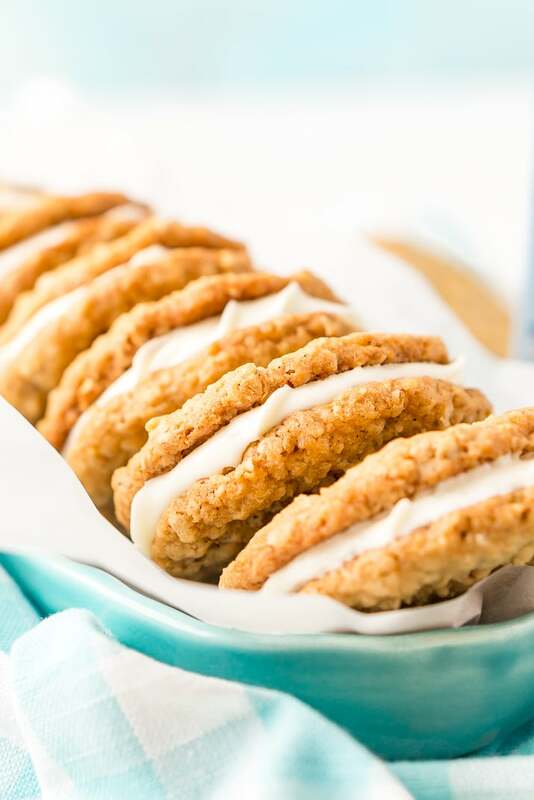 In order to replicate a homemade version of the childhood favorite, the cookies have to be thin and soft, and the cream has to hold its shape and lend lots of vanilla flavor. With this in mind, I scoured the frosting aisle on my recent trip to Walmart and picked up a new product: Pillsbury™ Filled Pastry Bag Vanilla Flavored Frosting. Thinking that buttercream would be too dense and icing too thin, I decided to try this Pillsbury frosting for its thick consistency and scrumptious vanilla flavor. But the real draw for me was that the frosting is packaged in a pastry bag with a built-in tip, so I could pipe the filling onto the cookies rather than glopping it on with a spoon! Once back home, I couldn’t wait to try out my new recipe with Pillsbury’s Filled Pastry Bag Vanilla Flavored Frosting. After baking a batch of thin but soft oatmeal cookies and letting it cool, it was time to add the filling to my Oatmeal Cream Pies. With the pastry bag ready to go, I swirled the smooth frosting onto half the cookies, then top them with another. 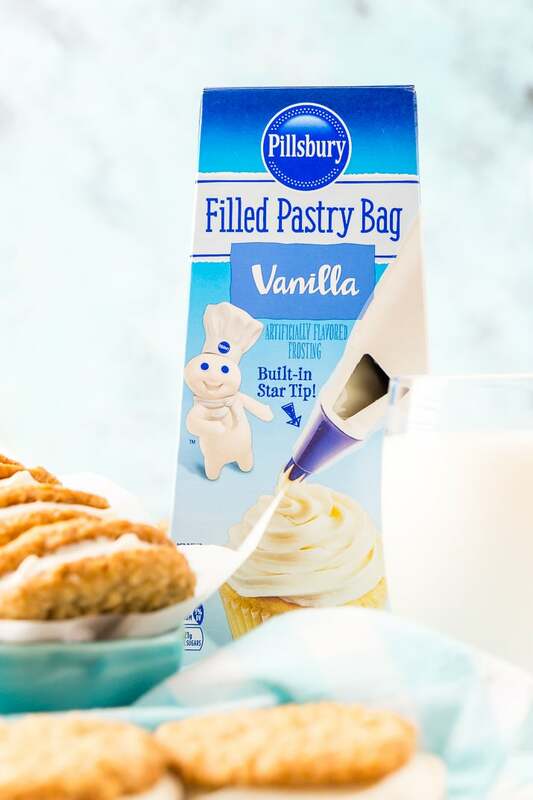 In addition to making for easy filling, the creamy vanilla flavor and texture of the Pillsbury frosting was perfect in these cookie pies – just like mom used to buy, only better! Almost everyone remembers indulging in these sweet snacks at some point in their childhood, and I can’t wait to share these with friends and family during our summer get-togethers! 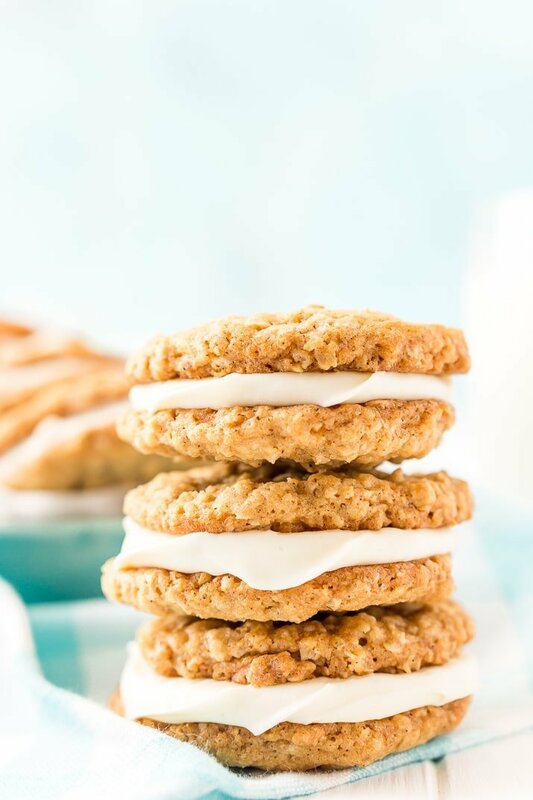 What’s more, when it comes to cookouts, reunions, or parties, it’s always easiest to have a few dessert options that don’t require plates or utensils; just grab a delicious Oatmeal Cream Pie and continue to mingle! These treats are also perfect to serve or bring to graduation parties or celebratory showers this summer. Just make sure to prepare a few batches, since adults and kids alike will all be eager to dig into these classic cookie sandwiches. After my experience with Pillsbury’s Filled Pastry Bag Vanilla Flavored Frosting, I’ll definitely be picking up the other two varieties (chocolate fudge and cream cheese) on my next trip to Walmart. The application was mess-free and easy, and when you bake as much as I do, hacks like this are total lifesavers! But even if you’re a novice baker, you’re going to love Pillsbury’s Filled Pastry Bags. They come with different shaped tip designs — stars, rosettes, swirls, and waves — so no matter how experienced you are, you can decorate cakes, cupcakes, and cookies like a pro! Have you ever tried to frost two or three dozen cupcakes for a special event, or even tried to fill your own pastry bag at home? By the time you’re done, there’s usually frosting stuck on your fingers and smeared everywhere… but not with these pre-filled pastry bags! 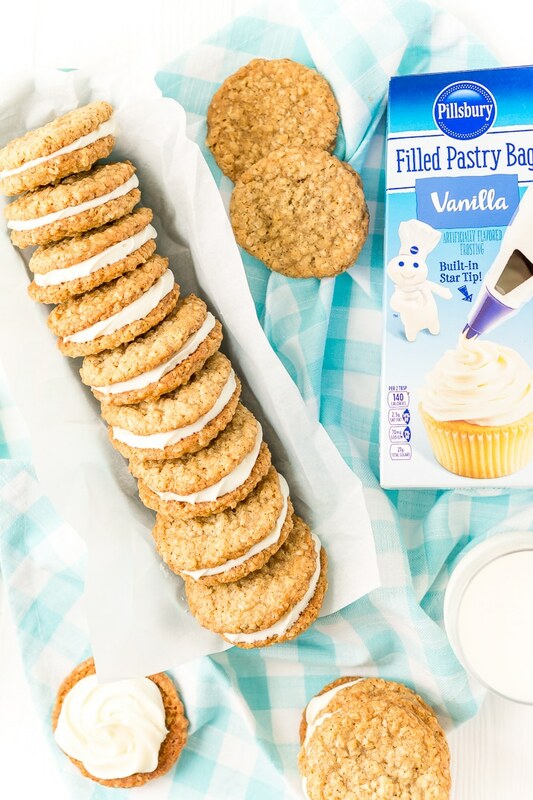 Whether you’re decorating a homemade wedding cake with stars and rosettes, or simply piping a swirl of frosting in the middle of your Oatmeal Cream Pies, Pillsbury’s Filled Pastry Bags are the easiest, tastiest way to add frosting and fun to any dessert. Pick up these products right at Walmart, and forget the spoon, spreader, and sticky mess! 1. Chill Your Dough – You want to chill your cookie dough for at least 1 hour before baking, this will ensure that the end result is a deliciously chewy (but stable) cookie, if you don’t chill your dough your cookies could turn out hard and crispy, not ideal for this recipe. 2. 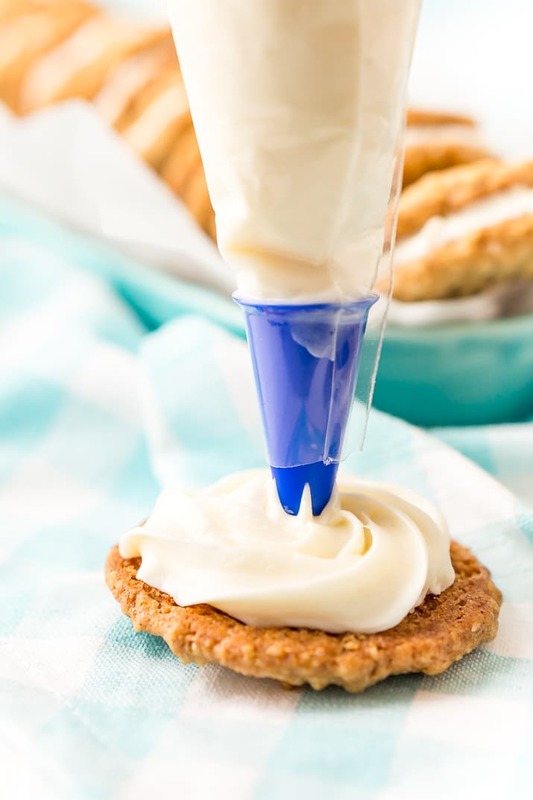 Use level scoops – By using a cookie dough scoop this helps to make sure all of your cookies are evenly sized which is really important when making sandwich cookies. Always make sure to level your scoops of dough too, I usually press mine against the side of my stand mixer. 3. Minute Oats – These cookies turn out best/chewiest when you use minute oats instead of traditional oatmeal. DO NOT use instant oatmeal, it’s not hearty enough for these cookies. Simply look for packages of Minutes Oats or 1-Minute Oatmeal in Walmart. 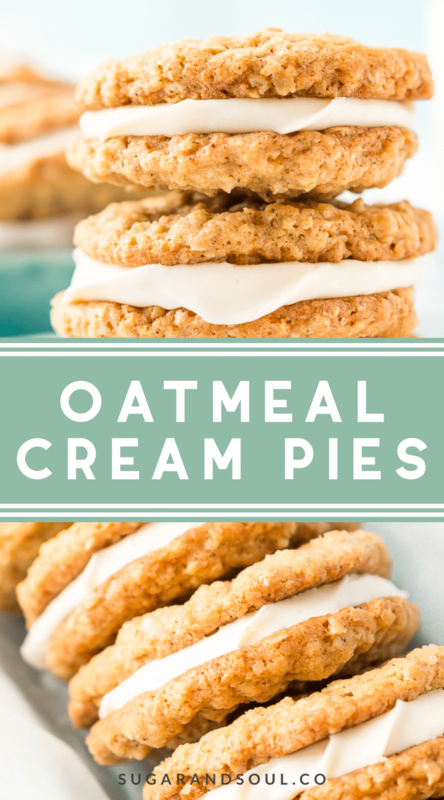 Pin this Oatmeal Cream Pies Recipe for Later! Preheat oven to 350 degrees F and line cookie sheet with parchment paper and set aside. In a large bowl or stand mixer fitted with a paddle attachment, cream the butter and sugars until light and fluffy. Add egg and vanilla and beat until combined. In a separate medium bowl, whisk together flour, baking soda, salt, cinnamon, nutmeg, and cloves. Add oatmeal to the flour mixture and stir to combine. Slowly beat dry ingredients into the wet ingredients, mixing on low until well blended. Chill the cookie dough for 1 hour in the fridge before baking. Use a medium scoop (1.5 tbsp) to drop cookie dough onto the prepared parchment lined cookie sheet at least 2 inches apart. Allow the cookies to cool for 2 minutes on the pan before transferring to a wire rack to finish. Once the cookies have cooled, pipe the Pillsbury™ Filled Pastry Bag Vanilla Flavored Frosting on the bottom of one cookie and sandwich with the bottom of another. Repeat until all cookies are used. Failure to chill the dough could result in crispy or hard cookies. Can these be frozen until ready for eating? Hi Laura, they definitely can! I recommend wrapping them individually in plastic wrap and then storing them in a freezer bag or airtight container until you’re ready to enjoy them. Let them thaw in the fridge or room temperature for a few hours before consuming (DO NOT MICROWAVE THEM).